The Verkhovna Rada Committee on Legislative Support of Law Enforcement has recommended that the Ukrainian parliament back the draft decree on consent to dismiss Prosecutor General of Ukraine Viktor Shokin. A correspondent of Interfax-Ukraine reported that ten parliamentarians voted in favor of such decision, four voted against and three abstain from voting. 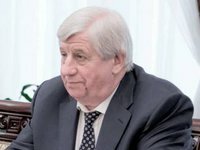 Some MPs said they would like to listen to Shokin before taking the decision on his resignation.